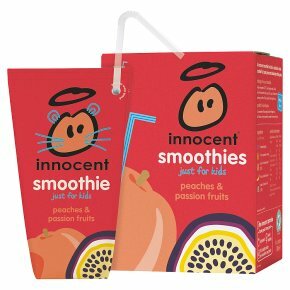 What are innocent smoothies for kids? We're glad you asked. They are a blend of whole crushed fruit, pure juice and absolutely nothing else. With so many kid's fruit drinks containing added sugar, sweeteners and e numbers, we thought it would be nice to make a healthy and natural drink for kids. We promise to leave out all of those nasty additives and never, ever use concentrates. All you'll find in our ingredients is 100% whole crushed fruit, pure juice and nothing else. A delicious blend of peaches & passion fruits, made with crushed fruit and pure juice. No concentrates, no added sugar or water, and definitely no bits. - It's made out of 100% pure fruit and juices and nothing else - 1 of your 5-a-day in every carton - Keeps for up to 12 hours out of the fridge, so perfect for lunchboxes Our innocent promise: 1. Tasty products - 100% pure fruit smoothies. No added sugar. No concentrates. No funny business. 2. Sourced sustainably - we use recycled & recyclable packaging, refuse to air freight and source ethically. 3. 10% of profits go to charity - find out more at www.innocentfoundation.org innocent drinks. Tastes good, does good. Gently pasteurised, just like milk. Shake before opening, not after. Perfect for lunchboxes Our smoothies will last happily out of the fridge for up to 12 hours, so they're perfect for packed lunches and days out.